Plagiarism is not a bad thing. If it were not for people copying other people, then the inspiration for something better may never have come along. Without plagiarism, the Simpsons wouldn’t have been born from the Flintstones, and Family Guy wouldn’t have been born from the Simpsons. If Joss Whedon had not copied Scooby Doo, then Buffy the Vampire Slayer and Cabin in the Woods would have never been invented. The problem is that getting away with plagiarism in the academic work is now so easy that colleges and universities are having a real problem with a wave of global plagiarism. What is worse is that students are not the only ones getting away with plagiarism, essay writing services are getting away with it too. That is why when a student hands in a plagiarized essay from an essay writing service, the college or university is duty-bound to punish the student as severely as possible. That is why it is more important, now more than ever, for essay writing services to create original works. People use our essay writing services at AssignmentHolic because we offer 100% unique content. All our work is completed by fully qualified and degree-educated writers. We create brilliant essays because our writers have already completed the qualifications that you are working towards. They have been there and done it, which is why they are able to create perfect essays at your behest. It is not in our interest to plagiarize. Our custom essay writing services do not hire cheap re-writers because they damage the overall quality of our essays, and they leave our student customers open to criticism in University. We do not copy or plagiarize because you are paying for original content, plus there are still some professors who can identify plagiarized content. Finally, we do not spin content. Spinning is a technique used to cheat plagiarism detectors, but the quality of the work is always very suspect to the point where it is obvious when a piece of work has been spun. We do not spin content, we write 100% original and unique essay content that is custom-written to your exact specifications. Can People Beat Plagiarism Detectors? 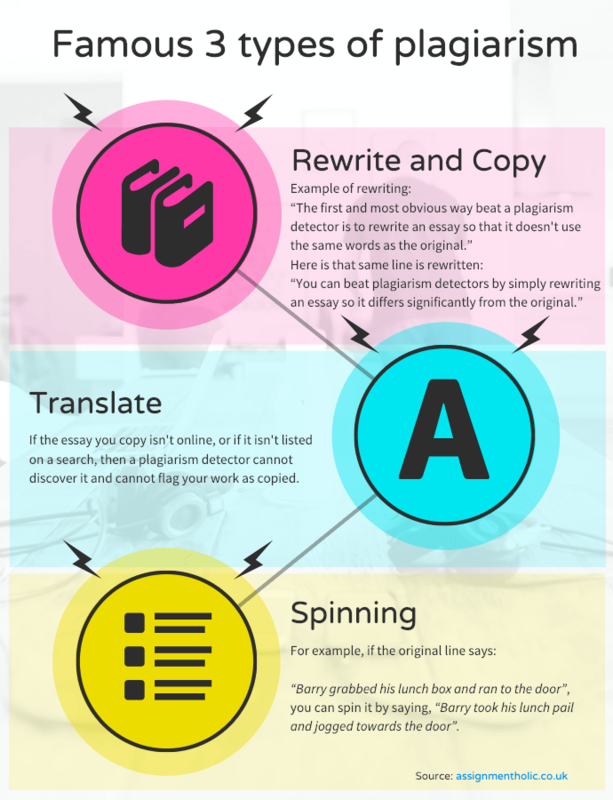 There are actually a few ways to beat plagiarism detectors. You can rewrite, you can translate, you can copy offline work, and you can spin. Plagiarism detectors work by checking strings of three words. They run an actual word search for three words in a row. For example, this paragraph starts with the three words “There Are Actually.” A plagiarism detector looks for those three words through Google, Bing and whatever other search engines it desires. It then searches for three more words in a string sequence, which in this case would be “Actually a few.” It takes note if the three-word strings appear overly often in another piece of online text. If a document has 5% of content matching an online source, then that document is flagged as plagiarized. Both lines said the same thing, but a plagiarism detector couldn’t know that you rewrote the first line. Find an essay you want to copy that is in another language. Copy it into Google translate and convert it into English. Tidy up a few spellings and grammar, and then pass the essay off as your own. Plagiarism detectors only search for the words in your text, they do not search for alternative language versions of your text, so you can trick a plagiarism detector even if the original foreign language essay is still online. Global plagiarism is so easy to get away with because plagiarism detectors use search engines to find copied content. If the essay you copy isn’t online, or if it isn’t listed on a search, then a plagiarism detector cannot discover it and cannot flag your work as copied. You may have read plagiarism articles about spinning. It is one of the oldest ways to fool plagiarism detectors, and it is used by people who are copying content that they do not understand. If they do not understand it, they cannot rewrite it, so they spin the content. That is why spinning using a plagiarism synonym technique is so popular with content mills because it means they can hire developing world writers with no experience and simply have them spin content rather than write original content or rather than have them rewrite content. Spinning exploits the fact that plagiarism detectors search for three words at the time. No three words appear the same as in the original. The plagiarism detector searches for strings of three words, but no three words appear the same in sequence in the original and in the spun sentence. Notice how the plagiarism synonym technique was used where “grabbed” was replaced by “took”, “box” by “pail”, “ran” by “jogged”, and so forth. If you are working towards a qualification, then plagiarism is a lazy way of completing projects without putting the work in. If you run an essay writing service and you allow your writers to plagiarize, then professors will notice a student is using an essay writing service and the student will get in trouble at their University. In the academic world, plagiarism is wrong because it doesn’t push research forwards, it only repeats what has already been said with a new person taking the credit. Why Is Incremental Plagiarism Becoming A Global Plagiarism Problem? The problem is that colleges and Universities around the world are making this a global plagiarism problem. Students are leaving college and University thinking that this is how research is conducted. If they enter assumptions and ideas of their own and they do not find a quote or source for such an idea, then they are punished and penalized. What is worse, students are heavily dissuaded from the notion that just one source can be correct. What if you found the most perfect book that had every answer you ever needed, if you only quoted that single source for your essay, then you would not pass. You would have to add a mix of sources, including some with contrary views from the sources you picked. Each essay a student writes is teaching a student how to “Not” think for themselves. It teaches students that copying from a bunch of different sources is both okay and that it counts as genuine research. Critical thinking people know that this is not true. Critical thinking people know that just one source can be correct and that 1000 sources can be wrong and just 2 can be can correct, and yet students are taught the opposite of this. Students are taught that more sources and quotes equal a better essay. These days, the students who buy their essays from essay writing services stand a better chance in the real world because they are not teaching themselves how to plagiarize in the name of research. Our writers at AssignmentHolic do not plagiarize. Our writers do not spin, copy, reuse, or rewrite. Everybody knows that our writers create 100% unique content for a fair price, they all have a degree qualification, and they all have English as their first language. Try our service just once, and you will wonder how you ever got by without use. We have a satisfaction guarantee, we have a no quibble refund policy, and we have the highest online reputation because we take care of our customers, because we do not cheat, and because we do not plagiarize. At AssignmentHolic, we will write your essays, your dissertations, and we will complete your assignments. We will edit your work, proofread your work, and we will even complete your presentation work. Our writers work in house, our writers hit their deadlines, and our writers work for fair prices. Make your mark, get the grade, and do what it takes to get to the top.